CAGAYAN DE ORO CITY, Philippines – On June 9, 1983, Ofelia Palencia and her 4 children were home in Malaybalay City in Bukdinon when an encounter between the New People’s Army and government troops ensued outside their house. Later that afternoon, Ofelia, a widower, was arrested by the military and brought to an unknown camp. The following day, the military brought her back home but took his eldest son Rudy, then 19 years old. The family has not seen Rudy since. On Friday, February 7 – exactly 31 years after the incident – the now wheelchair-bound Ofelia made her way to Cagayan de Oro to claim compensation for her son’s disappearance. Frail and already weak, she lined up and presented documents to prove her identity and that of her son’s. 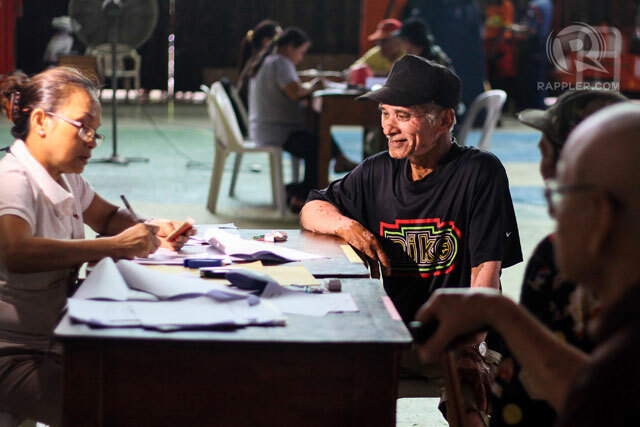 At least 170 other victims of human rights violations during Martial Law showed up at the Barangay Nazareth gymnasium to get their compensation. The payment is part of the provision of Republic Act 10368, which provides for reparation and recognition of victims of human rights violations during the Marcos regime. According to lawyer Nestor Montemor, who assisted and coordinated the distribution of the compensation, 175 martial law victims from Lanao del Norte, Bukidnon, Misamis Oriental, Camiguin, and Misamis Occidental were able to received their compensation first in February 2011 and then on Feb. 7, 2014. Each victim received P43,200 pesos on February 2011 and another P50,000 on Friday. Montemor said the compensation were received either by the sons, daughters, or acknowledged representatives of the victims. He said there were 9,539 victims who filed a class suits against Ferdinand Marcos in Hawaii. Hugo Orcullo, a former media practitioner, came assisted by his wife. He was was arrested and imprisoned twice during Martial Law. Anita Lequin’s husband Dionesio was a barangay official in the hinterland town of Magsaysay in Lanao del Norte in 1985 when the military suspected that he was a member of the Masa of the New People’s Army. Dionesio was executed by members of the Civilian Home Defense Force (CHDF) in front of their house and in the presence of his family. Anita shared that they feel the terror up to this day, and that they leave it up to God to bring justice to her husband. “We have forgiven them and only God can judge them,” Anita said of her husband’s killers. Orcullo, who lost his voice to a throat surgery, said some complainants in the class suits, now really old, are dying. But the pursuit of justice continues, he said. Writing on a board that he carries around, Orcullo, chair of the local Samahan ng mga Ex-Detainess Laban sa Detensyon at Aresto or Selda, said Martial law – the darkest time in the country’s history – should not happen again. For Pastor Tenorio, another media practitioner from Iligan City, the cash compensation is part of the closure, “but it is the fight and pursuit of principle against a dictator who did us injustice” that is more important. He was arrested twice and imprisoned for two years without charges. American lawyer Robert Swift, in his letter to the victims of Martial Law, said that should there be another collection of funds from the Marcoses, another round of distribution will happen. As for Ofelia Palencia, the compensation is bittersweet. The closure, she said, would come only if and when the body of her son Rudy would be located, and they can move on with their lives.